Street food is easily one of the best things a country can offer. Unlike other countries where you eat by the road side, Singapore’s version of street food is what we call hawker food, and they are found in food/hawker centres – which are usually located in the heartlands. For what is lacking in the electrifying atmosphere of eating by the street, the hawker centres in singapore make up for it by serving clean and tasty food, in a comfortable environment. Tiong Bahru Market is one of the most popular hawker centres in Singapore. I always go there when I am craving for local food. Here are some of the things that I order when I am eating there. 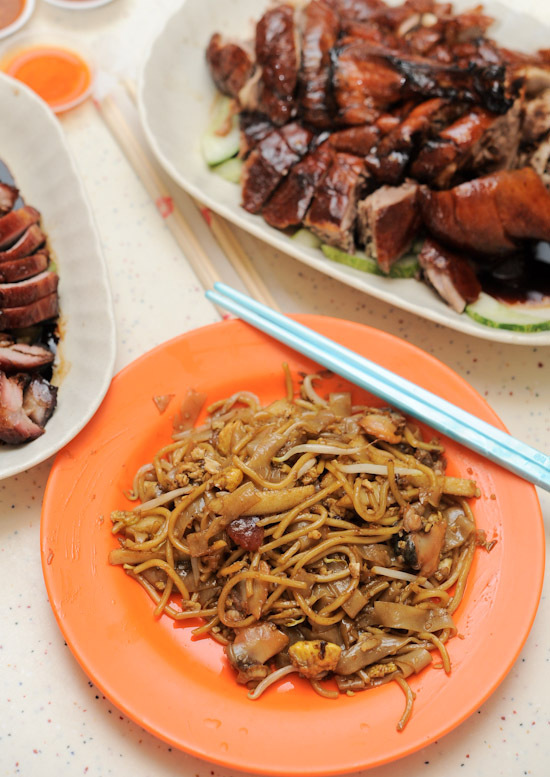 It is no secret that Singaporeans love queuing up for food. In a way, it acts as a guide to the more popular stalls in a hawker centre, but it is not accurate all the time. Judging from the queues when we were there on a Sunday morning, the best food stalls in Tiong Bahru Food Centre (in no particular order) are: Pork Ribs Prawn Noodle (#02-31), Koh Brothers Pig Organ Soup (#02-29), Tiong Bahru Hainanese Boneless Chicken Rice (#02-82), Wanton Noodles (#02-30), 178 Lor Mee (#02-23) and Tiong Bahru Lee Hong Kee Cantonese Roasted (#02-60). This is one of the best food in Tiong Bahru Market – Tiong Bahru Lee Hong Kee Cantonese Roasted stall. The long queues are annoying but the Char Siew and Roasted Pork are out-of-this-world-good. I grew up eating the roasted duck. When I was a kid, my parents would bring me to the old Tiong Bahru Market during the weekends. Ahhh, those were the days. The chicken rice from Tiong Bahru Hainanese Boneless Chicken Rice stall is very very good. To me, they are easily one of the best chicken rice stalls in Singapore. The Steamed Hainanese chicken rice here is wildly popular, but I always prefer roasted chicken, and their rendition is equally good anyway. Besides the popular stalls that I’ve mentioned, you can also try the following at Tiong Bahru Hawker Centre: Peranakan food like Buak Keluak and Ngio Hiang from the fairly new Daisy Dream Kitchen (#02-36); hot and soupy Kway Chap (#02-43); another Lor Mee option from Tiong Bahru Lor Mee (#02-80); piping hot Char Siew Bao and Siew Mai from Tiong Bahru Pau (#02-18); and handmade fish balls from Teochew Fish Ball Noodle (#02-13). And of course, no visit to Tiong Bahru Market is complete without eating Chwee Kueh. Among the two Chwee Kueh stalls there, I prefer Jian Bo Tiong Bahru Chwee Kueh (#02-05) – which is one of the few original stalls from the old Tiong Bahru Market. Next time I go to Singapore I will bring along your post! I want to try the hand made fish balls. Tiong Bahru is my favourite place to eat at! I couldn’t agree more with the chwee kueh and lor mee. I’m gonna have to try the chicken rice next week! what si a good hotel near to this market place?? Is the tiong bahru market open 24 hours?